The purchase of chairs invoiced at Rs. 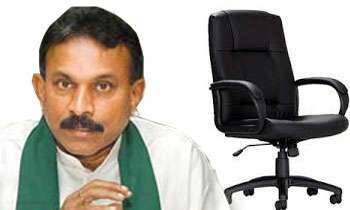 644,000 each for the use of the new Western Provincial Council Chamber had been completely stopped by the Western Province Governor Hema Kumara Nanayakkara basing on allegations that there had been an irregularity in the process of procurement of these chairs. The Governor’s attention has also been drawn to the fact that with the termination of this purchase if there arises any loss , such loss is to be recovered from those who were involved in this matter . Why is this guy called a "Governor" ? We've never heard of him having taken any other governing decision !! But this fellow is also a crook, how did he amass so many tourist boutique hotels in the south? Honorable Governor, what about the Historical antique DOOR which "Usiru Devapriya" saying this Antique Door has made to remember for school children's regards the historical value of mother land, he is a big lair.School's all over Sri Lanka are teaching enough for children's about the historical value of Sri Lanka.I think his next attempt will be TABLE's. Ask Isura to make a program for all the Colombo school children to come and stand in queues in front of door so that he can teach them Kotte heritage.He can earn money from selling tickets. A great stand by the Governor. Congratulations. Sad, the poor and sad bums! Oh !! governor you make a big mistake. now you have to build a hospital to treat brain damage issuru and set of lunatics who favored issuru.